Daring escape shows al-Qaeda’s growing confidence at challenging authorities in southern Yemen amid country’s unrest. 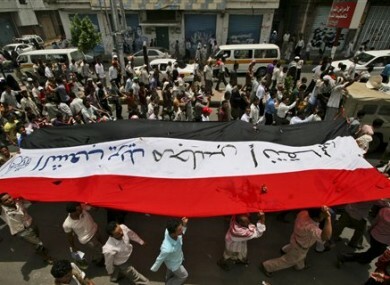 Yemeni protesters in Taiz calling for Saleh's resignation on Monday. DOZENS OF al-Qaeda militants battled their way out of prison today in the latest sign that Yemen’s political upheaval has emboldened them to challenge authorities in the country’s nearly lawless south, security officials said. In a carefully choreographed escape from the Mukalla prison in Hadramout province, 57 al-Qaeda-linked militants attacked their guards and seized their weapons before they made their way through a 45-meter tunnel to freedom. Simultaneously, bands of gunmen opened fire at the prison from outside to divert the guards’ attention, the officials said. At least one guard was killed and another wounded, said the officials, who spoke on condition of anonymity because they were not authorised to speak to the media. The 57 were among 62 inmates who escaped. It was not immediately clear whether the other six were also Islamic militants. The officials said many of the inmates who escaped belonged to a local Hadramout cell blamed for a series of attacks on security forces in the last two years. Their leader, Hamza al-Qehety, was believed to be among those who escaped. The last major breakout by al-Qaeda militants in Yemen took place in 2006, when 23 escaped a Sanaa detention facility. Among them was Nasser al-Wahishi, who went on to become the leader of al-Qaeda in Yemen, as well as Qassim al-Rimi, a dominant figure in the group. Al-Qaeda’s branch in Yemen has been linked to several nearly successful attacks on US targets, including the plot to bomb a Detroit-bound airliner in December 2009. The group also put sophisticated bombs into US-addressed parcels that made it onto cargo flights last year. Al-Qaeda-linked militants seized control last month of two towns in Abyan, another southern province, and briefly took control of several neighborhoods in the neighboring province of Lahj last week. Some of these militants belong to groups that have been quietly tolerated by longtime ruler Ali Abdullah Saleh and used to counter the weight of other extremists or against secessionists in the mostly secular south of the country. Yemen’s political crisis began when demonstrators inspired by successful uprisings in Egypt and Tunisia took to the streets in early February to demand Saleh’s ouster. The largely peaceful movement gave way to heavy street fighting when tribal militias took up arms in late May. Saleh, Yemen’s president of nearly 33 years, was badly wounded in an attack on his Sanaa compound earlier this month and is undergoing medical treatment in Saudi Arabia. The head of Yemen’s most powerful tribal confederation warned yesterday in a letter to the Saudi king that Yemen could plunge into civil war if Saleh is allowed to return home. Vice President Abed Rabbo Mansour Hadi became acting president after Saleh’s departure. The opposition has accused Saleh’s inner circle and family of hindering the opposition’s dialogue with Hadi. Email “Dozens of al-Qaeda fighters escape from Yemeni jail”. Feedback on “Dozens of al-Qaeda fighters escape from Yemeni jail”.